The Mormon Wrap--Encircled in God's Love contains 70 poems and was compiled, for the most part, by the author, Carolyn Perry Fife, as a means of "wrapping up" lessons she has taught in auxiliary organizations of the Church of Jesus Christ of Latter-day Saints. Sister Fife has spent many years teaching young women in the MIA programs; sisters in Relief Society; children in Primary; adults and youth in Sunday school, and teachers in Inservice. As part of her own personal growth, Sister Fife found it spiritually uplifting to "wrap-up" as many lessons as possible with a summarizing poem. Hence her poems cover a wide range of subjects. Her children and others have found that the poems are an excellent way to "wrap-up" a talk, or, for the youth of the church, to use as two-and-one-half minute talks and for seminary. The reader is bound to find a verse or two to create the "Mormon Wrap". 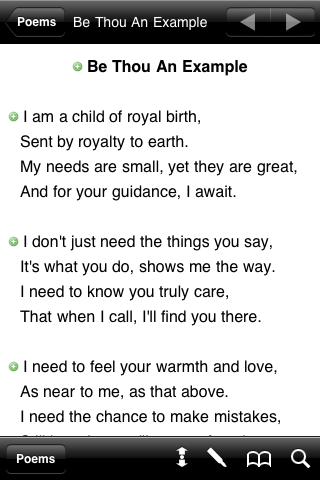 But, for whatever the purpose or reason for reading the poems, it is the express purpose of the author to assist the reader in feeling the overwhelming and unconditional love that our Heavenly Father and our Savior, Jesus Christ, have for each of us--that the reader will feel "Encircled in God's Love". 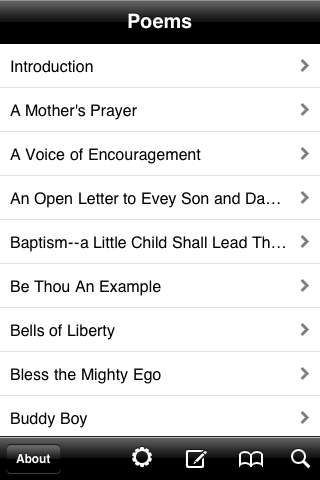 App development by Standard Works LLC - the creators of the best selling "LDS Scriptures" app.